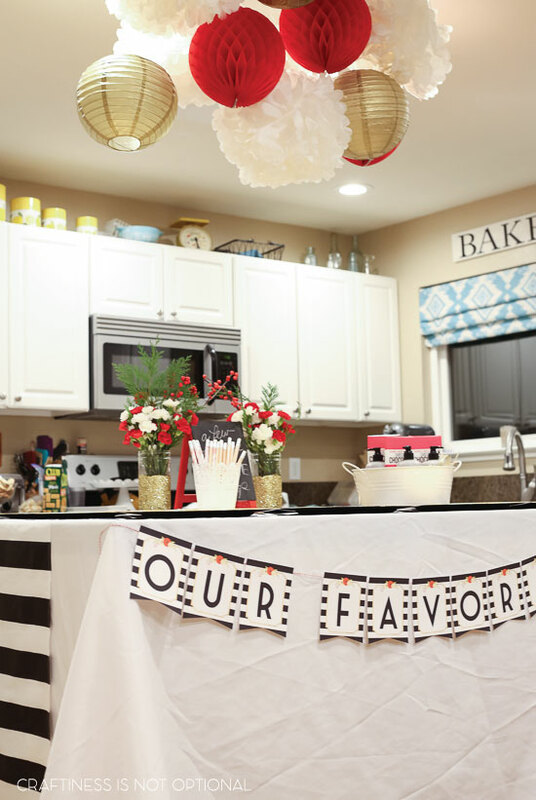 I’ve always wanted to host a Favorite Things party, and decided this was the year! 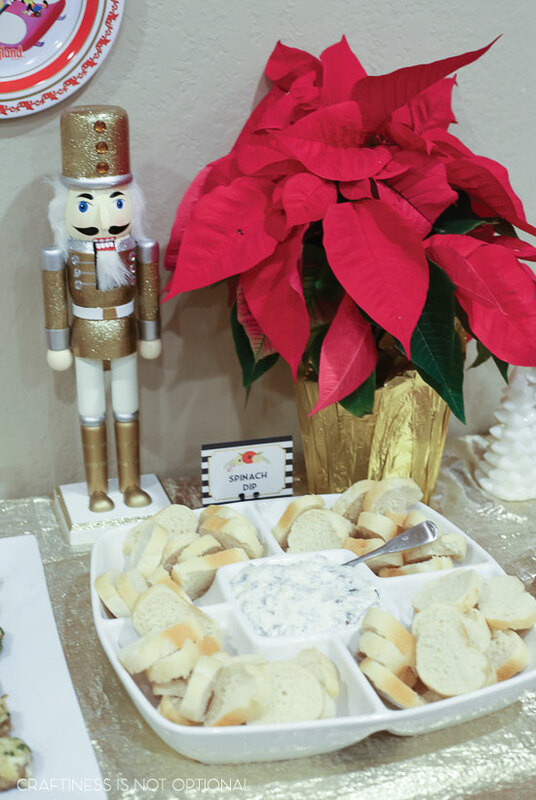 I threw it in there with all the other holidays shindigs and Nutcracker performances, just to make my holidays a bit crazier, lol. It was worth it, I think! 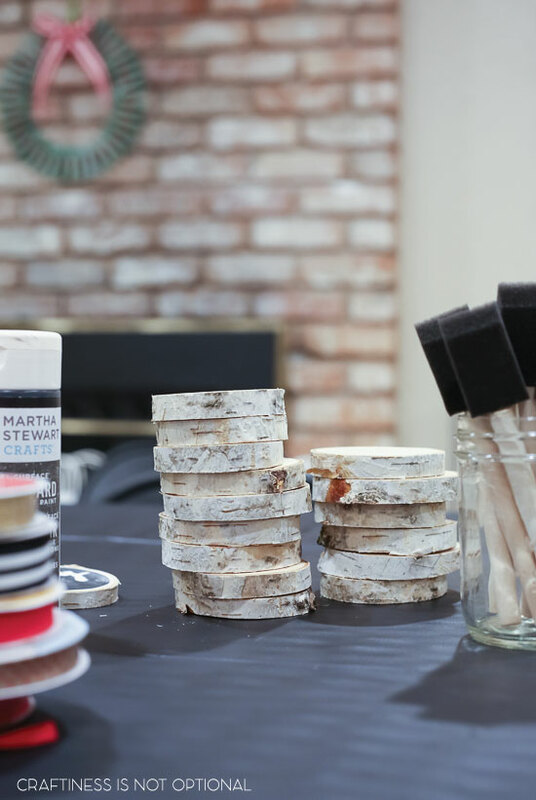 We all had a blast hanging out with each other and went home with some AWESOME new favorite things! I went with a black, white, red, and gold theme since I already had Christmas decor up and I figured it would mesh well with it! I made caprese skewers with grape tomatoes, mozzarella balls, and basil leaves on a toothpick. YUM! I added some balsamic vinegar for us to sprinkle on top if desired. 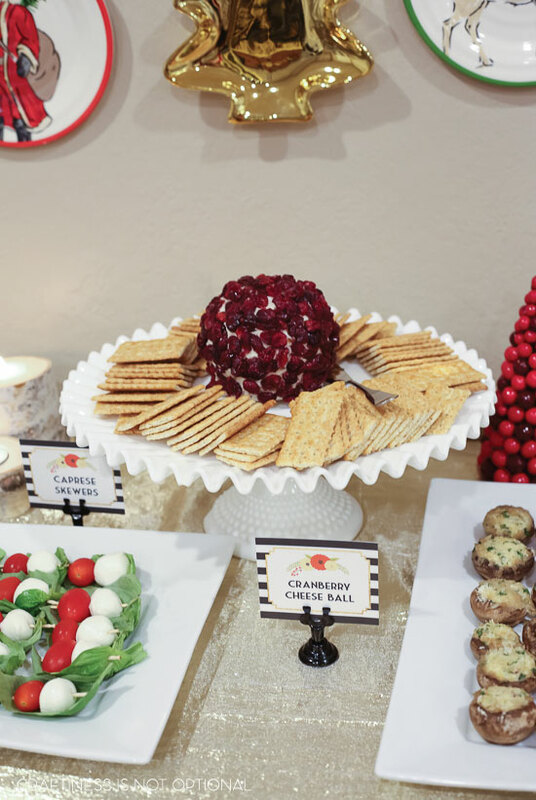 A cranberry white cheddar cheese ball. YUM! 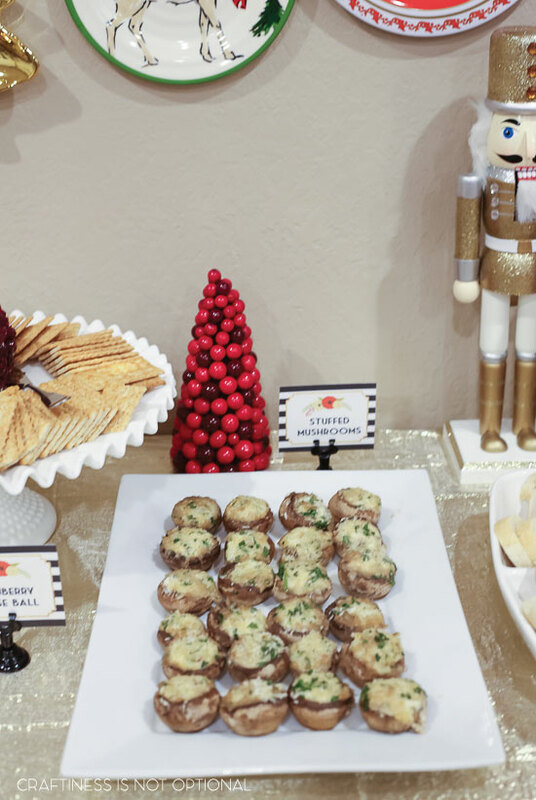 one of my fave appetizers-stuffed mushrooms! and some delish (store bought lol) spinach dip. Sometimes you gotta cut corners. 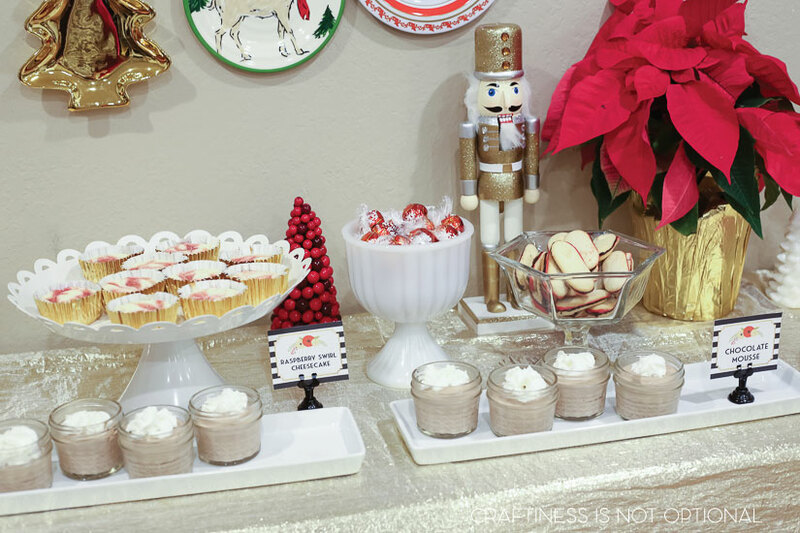 For dessert I made chocolate mousse cups, and raspberry swirl cheesecakes…and put out some Lindt truffles and candy cane milanos because I can’t stop. I had my island set up for all the favorite things to be arranged on, along with some flowers and a cute chalkboard. And hangy things. gotta have hangy things. 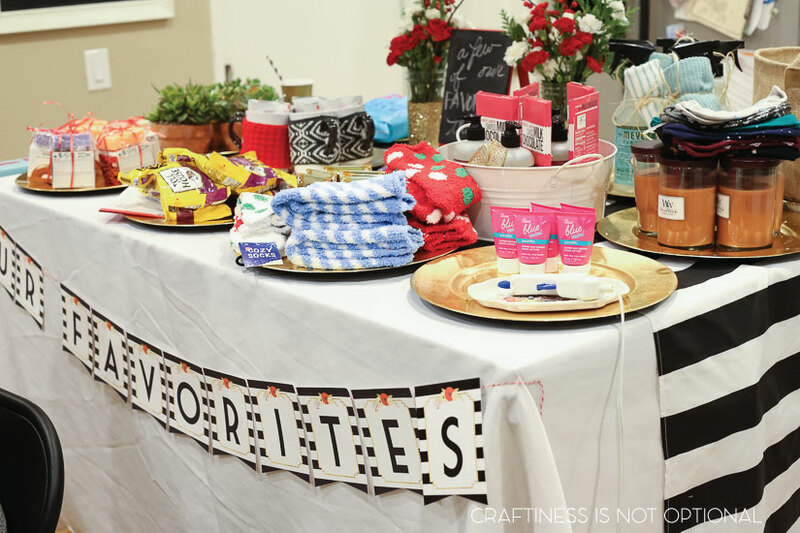 We had cozy socks, chocolate chips, candles, soap, lotions, chocolate, mugs, succulents, cleaner and washcloths, popcorn, and a bread basket-everything was adorable and I think we all went home with amazing new finds! I loved what I got! I created a favorite things questionaire that we all filled out anonymously…then I read them out and we tried to guess who it belonged to! It was so fun and I found out some things I didn’t know! After we had guessed whose was whose, we had that person draw five names from a container where we had all put our names in 5 times, and they took home one of that person’s favorite things! On to the favorite things! 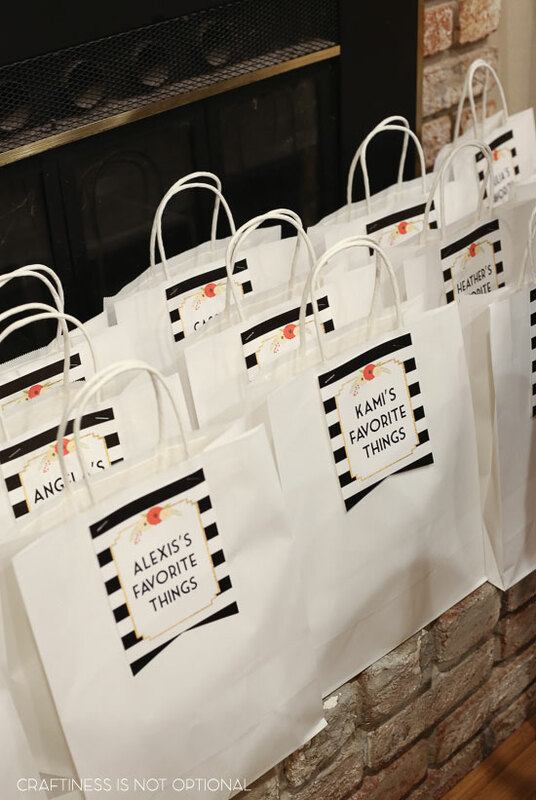 Bought some white bags and added some personalized tags for each of my friends to have their own SWAG bag! 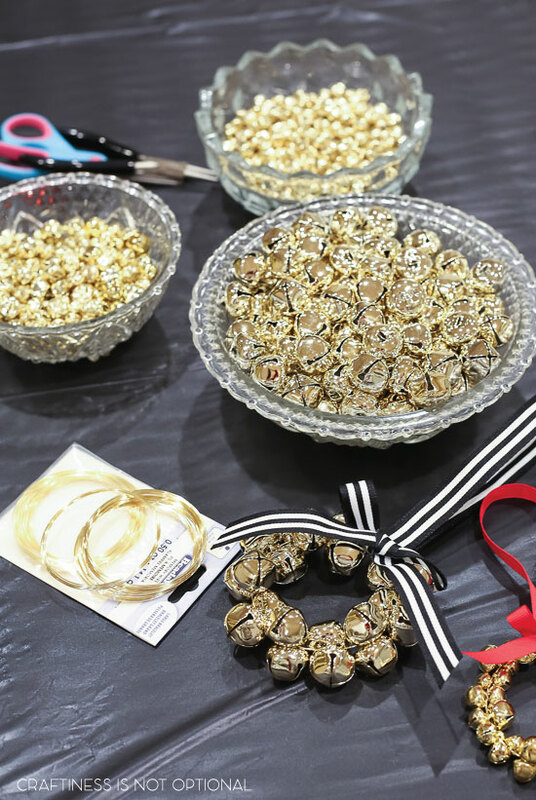 and these bells became bell wreath ornaments. So fun! I think it was a really fun night and I definitely will be doing this again…maybe an annual partay!? But what were the favorite things you all exchanged?? I want to know! Never mind, I see the picture now! 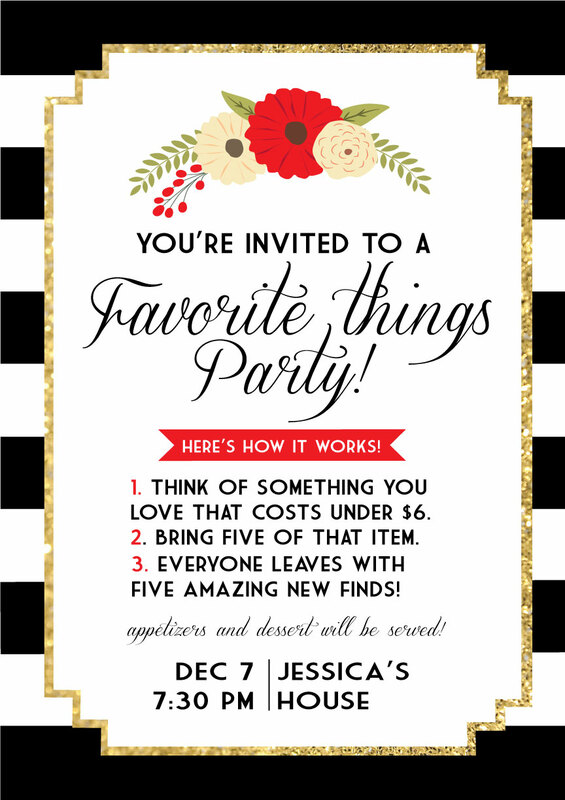 I just got this is my email today and had such a fun time looking at all the lovely things you have out for guests. 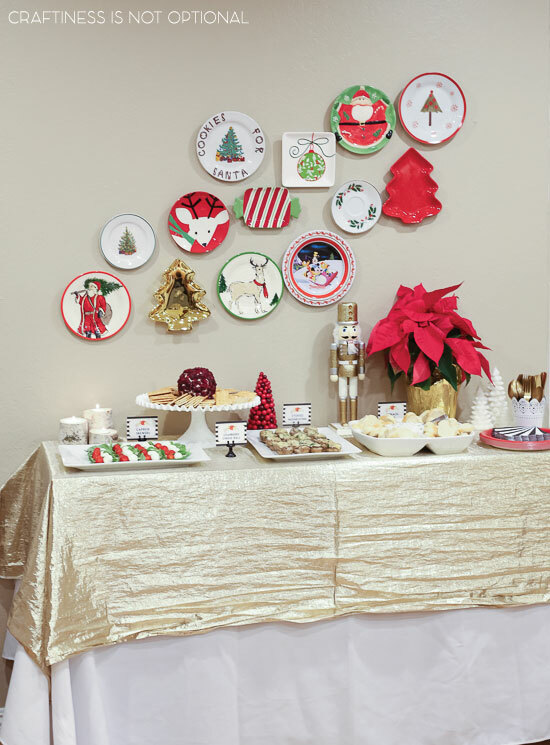 I especailly like the idea of giving gifts under $6 for all the guests. 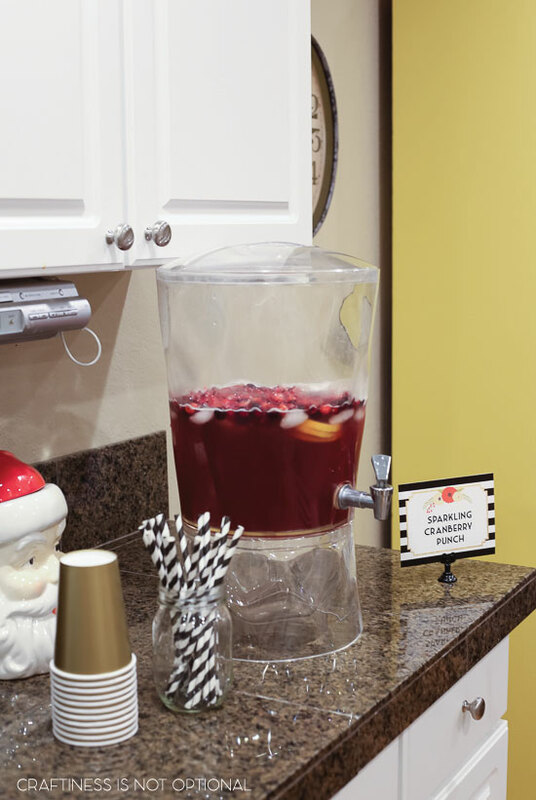 That is such a great gift exchange idea and doesn’t cause undue financial stress. This sounds like so much fun! I love the matching invitations, banners, signs, and things! aww what a fun idea!! I love this!!! Very fun, Jessica. Where’d you get the invites? I think they’re adorable. 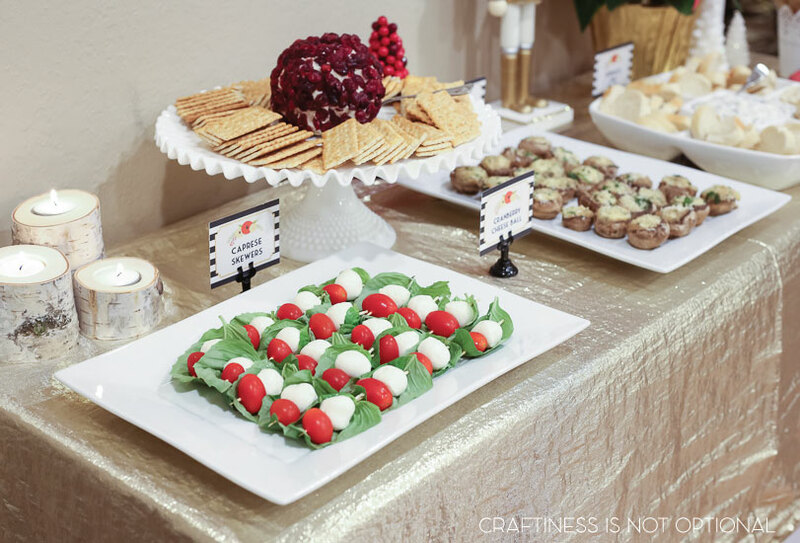 Your parties are the best! You should move near me and invite me to all your parties. And then plan all of my parties! Would you be willing to sell all your cute tags, banners, invites, etc? I love them and also have a favourite things party every year with these colors! Love it! I will be trying this with my book club this year. So Oprah-ish? Where can I get these invites? I love them!! You did a great job! Where did you get all the printables from? Do you sell the printables? Love them! After we had guessed whose was whose, we had that person draw five names from a container where we had all put our names in 5 times, and they took home one of that person’s favorite things! I don’t understand! What person drawed five names? If you put your names in 5 times then when they drew was there duplicates of the same name drawn? Did everyone get a gift or only the winners of the games? Thanks! Each person drew 5 names from the bucket and they took home the favorite thing of the person drawing. Everyone brought and got 5 things. I just came across your post on Pinterest. 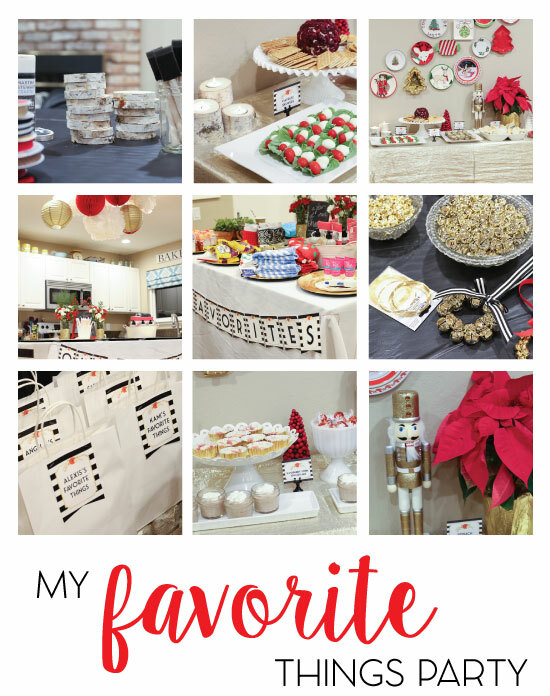 I am looking forward to hosting my first Favorite Things Party in December. 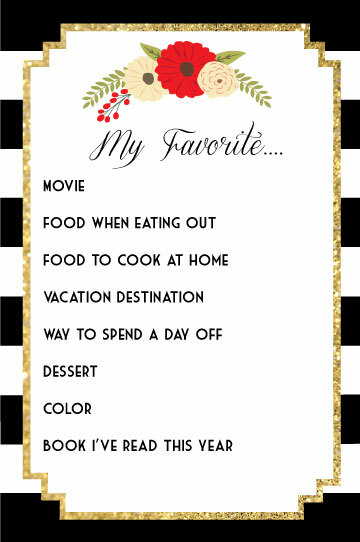 I’d like to know if your invite and other printables are available. Please let me know. Thanks for sharing your creativity.